Do I need an account to buy products on Sellfy? How do I reset my download limit? How can I find my purchases list? 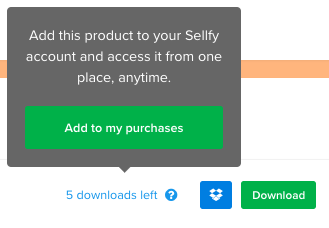 No, you do not need an account to buy products from sellers who use Sellfy. You certainly do not need to upgrade to PRO because it will not solve purchasing issues if there are any. 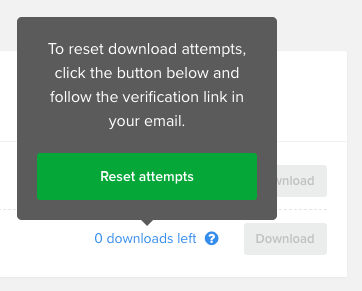 If you've clicked on the Download button more than 5 times, you'll run out of download attempts. You can re-send a fresh link to your purchase email if needed. In the pop-up, click Reset attempts. Note: If you made a purchase with an incorrect email address, you won't receive the reset link to the correct email inbox. Please write to [email protected] and we'll help you out. Note: You must first verify your account email address to have your purchases added to your account automatically. You should receive a verification email shortly after opening an account. The list of all your purchases from Sellfy sellers is only available if you have a buyer account. If you register an account on Sellfy, all your previous purchases will always be available from any device on your My Purchases page. How to add new purchases to my purchases list? Note: You can also add purchases that you bought with a different email address that doesn't have a Sellfy account. Simply log into your account and go to the purchase download page to add the product to your purchases list, as instructed above. 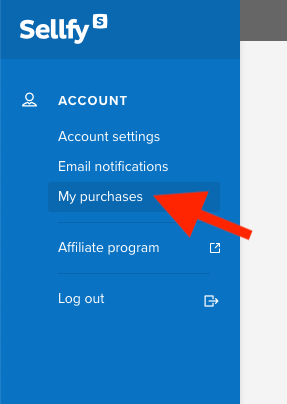 If you bought a product without signing into a Sellfy account, you can manually add your new purchases to the My Purchases list. 4. In the pop-up window, click Add to my purchases.